Here’s an image: Steve Bannon, Donald Trump’s chief strategist in the White House, wandering through the Cannes Film Festival, hands stuffed in cargo pants—always a mistake—failing time and again to land distribution deals for a pair of far right-wing documentaries. It unfolded, this glorious image, and it happened just a year ago. Yep, one of the most powerful men in America was a non-entity at this gathering of the cultural elite, at least according to this new piece from The Hollywood Reporter. The Reporter article says that most of the executives and buyers they talked to don’t recall Bannon even being there, and the ones who do say his screenings were bona fide duds. “Virtually no buyers attended,” recalls one acquisition executive. “It was total amateur hour.” Maybe he should’ve been shopping around that rap musical about the L.A. riots instead? Don’t feel too bad for Bannon, though. 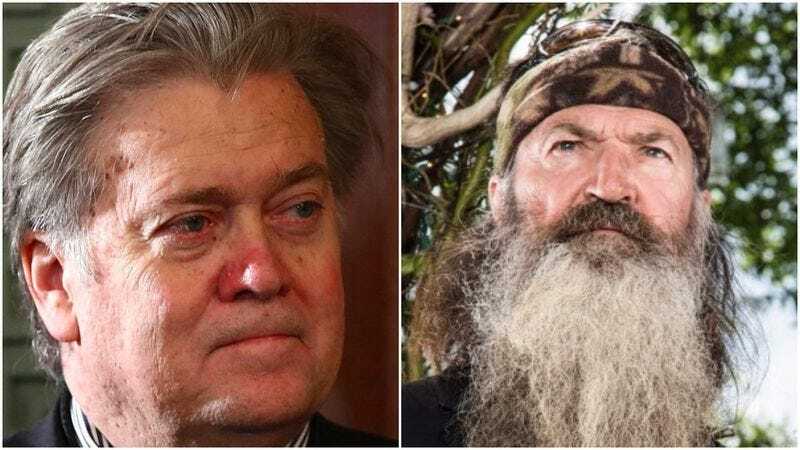 He had rich backers like billionaire Robert Mercer with him, as well as his good friend Duck Dynasty star Phil Robertson, who lent Bannon’s documentary Torchbearer some of his charmingly folksy thoughts on buttholes. The two were apparently living like rock stars there, despite no one wanting anything to do with them. Presumably, the Mercers also helped pay for last year’s trip to Cannes, which couldn’t have been cheap: Robertson had a suite at the Carlton and was traveling not only with a publicist but also with an armed bodyguard, telling THR at the time that he was worried about the ISIS threat (“I’m not authorized to discuss,” is all the reality star would say about the specifics of his fears). The Mercers — and if the name is familiar, it might be because Robert has been in the news lately for battling the IRS over $7 billion in back taxes — even hosted a lavish party for Bannon aboard their yacht, the Sea Owl. Sources say the star turnout was minimal. One wonders if Bannon misses those halcyon, pre-fame days during which he could ride the open seas alongside a government fraudster and a racist reality show star, lazily discussing cloning, abortion, and Mel Gibson. Ah, memories.